It's true: I have the sweetest wife in the world. In honor of my next book, Sweet Misfortune, she got me a huge, chocolate-dipped fortune cookie for Valentines Day. It weighed several pounds and took the whole family to eat. The custom message inside was just as sweet as the cookie itself. Thanks Rebecca! "Bev F." Congratulations Bev! I used a random number generator, which selected you (the 40th entry among 47 total) as the book winner!. 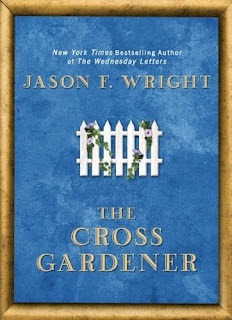 Please shoot me an email with your mailing address, and Jason will get an ARC of The Cross Gardener out to you shortly. To everyone else: thanks for participating! Can it really be true? Kevin Milne is hosting a giveaway for a book by Jason Wright? The Jason Wright? As in, the New York Times best selling author? The one who wrote Wednesday Letters, Recovering Charles, and who is literally changing lives with his Christmas novella, Christmas Jars. Yes, yes, yes, yes, and yes! It's all true. Jason is a heckuva guy, and has kindly agreed to send one of you a signed ARC (advance reader copy) of his newest book, The Cross Gardener, which hits bookstores on March 2, 2010. I had the pleasure of reading a .pdf copy of this book a number of months ago, and I promise it wont disappoint. It will tug at your heartstrings and cause you to reflect on what it means to live. Glenn Beck has read The Cross Gardener too, and describes it as "Passionate, spiritual and thought-provoking." So how can you win this fantastic book? Easy! Just reply to this blog and let me know that you'd like to be entered in the contest. If you have a favorite Jason Wright book and want to others know about it, feel free to share that in your comments too.The winner will be selected at random on February 9th. I'll post the winner's name here on the blog, so be sure to check back.